Srini has over 30 years of broad-based global consulting experience, particularly in Asia and North America. Srini Srinivasan has 30 years of diverse global experience in management consulting in Asia and North America. He is currently the Managing Director of Arthur D. Little India, and is based in New Delhi. He is a subject-matter specialist in Strategy, Organizational Transformation, Operations Improvement and Analytics-led Digital solutions. Srini has worked extensively across multiple industry verticals, including Automotive, Oil & Gas, New Energy, Health Care and Information Technology. He has led several successful transformation efforts in client companies, and managing complex organizational change is a key professional area of interest. He also serves as a peer counselor to CXOs. Srini has deep practical experience in creating new businesses, having led, or been involved in, multiple start-up ventures in the consulting, information technology and biotechnology spaces. 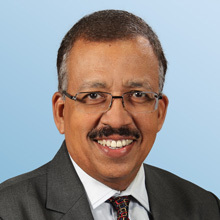 Previously, Srini has held Country Leadership and Practice Leadership positions in three global management consultancies, and also served in senior management roles in information technology and biotechnology companies. Married with a daughter, Srini is an avid nature lover, with keen interest in observing animals in the wild, as well as in animal rescue. He is also an armchair sportsman, and is passionate about cricket and American football.